The Cambridge University Boat Club had two boatmen over a period of one hundred years. It had Cooee Phillips from 1880-1930, then he was succeeded by his apprentice, young Alf Twinn, from 1930-1980. Like hundreds of oarsmen from the CUBC, I’d heard all the legendary stories about Alf, a man who was deeply respected and feared in almost equal measure. He would always call the oarsmen “sir”, but I am sure he would have spelled it “cur”……. Well today, two of Alf’s former charges, Paddy Broughton and I, experienced Mississippi “Mans Water”. 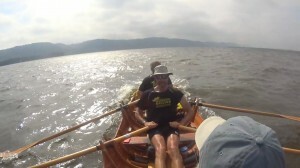 We added 4 extra miles today to take the strain off Dan Adams and my wife Julie, who are our next two participant rowers. Thismeant we were covering 34 miles and we watched the weather reports with grim faces as we saw the wind once again blowingunseasonably from the south at 15 knots, gusting to 25 knots. 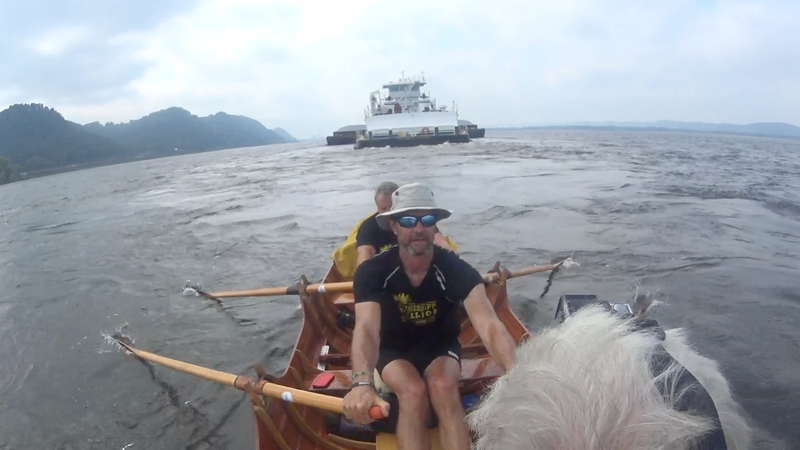 To make matters much, much worse, we were rowing from La Crosse Wisconsin, where the river reaches 4 miles wide. This in turn leads to a vicious wind against a strong tide with all the wave action you can imagine. And, as we are heading due south, a brutal headwind. Jerry Dale steered us as well as he could, but even with the custom made bow and stern canvasses on the skiff, we still shipped water. We pumped out as much as we could and continued to haul the 450lbs of wood with maybe another 100lbs of gear into the headwind, mile after ludicrously slow mile. Although we did not sink, we were close. At one point, we rowed up against the stern of a huge tow barge to try to get some shelter – any kind of shelter. The jokes and stories dried up and we concentrated hard and tried desperately to support each other. It was challenging stuff for sure. We finished after 8.5 hours, bent and exhausted, at Lansing, Iowa and we have maybe half an hour before dinner, bed and another 25 miles tomorrow. We are still cheerful as we feel properly tested by this river and so far we have bent, but not broken. I hope the river is now beginning to respect us too. Bent maybe, but never broken. Wonderful reads. Thank you, even though you both must be exhausted. I will make a long overdue donation… I have a year on an exchange in Oz so will miss the 2016 Hawks dinner…. I think the first (or poss second) I have missed!